Made a new shabby journal over the weekend, to replace the Winter/Spring Journal that's nearly complete. 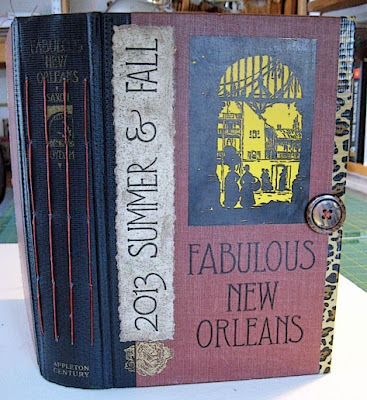 This time I bound the pages into an existing book cover instead of creating a soft cover with fabric and Timtex as I did with the previous two shabby journals. 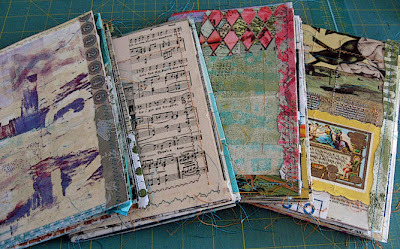 I call them "shabby" because of the way the pages are built, with lots of stitched-on odds and ends. I learned this in Mary Ann Moss's Remains of the Day. This book was the right thickness to house four signatures with room for expansion, and the page height was perfect. The cover was too wide, though, so I sliced off 1/2 inch from the edge of front and back. Then covered the edges in deco Duck tape to match the inner spine reinforcement. The end papers are the first two pages from the original book. Inside front cover after binding. Signatures prior to binding. 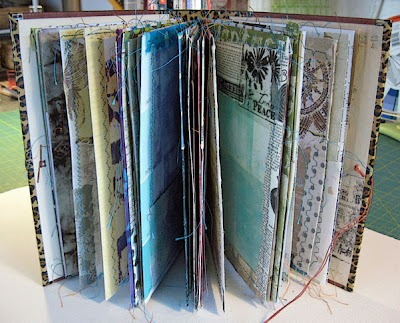 I had shabby pages left from when I originally created them, last summer. Making the pages was so addicting that I ended up with 50 finished pages! 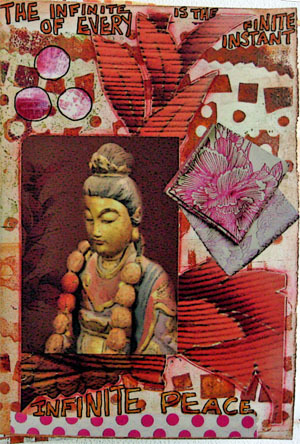 I used what I had left, here, plus I added new pages made from Gelli Plate offprints that I funked up with stitching, papers and tons of pockets on Saturday. Finished journal ~ four signatures of four folios each, 30 pockets, more room to write than in previous shabby journals, button/waxed linen tie closure, 5-hole pamphlet stitch binding. So what will I use this journal for? Good question! No...actually I'll use it to record almost-daily snippets of primarily studio activities, weekly lists of projects (for you goals freaks, consider these weekly goals), be-here-now entries if I journal off site (a rare occasion but it does happen now and then)...stuff like that. 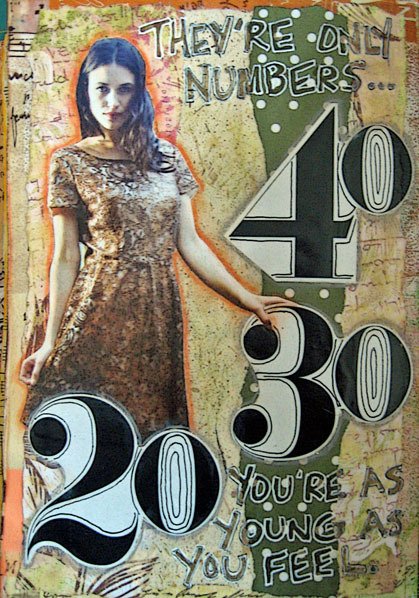 At least, that's what I did in the last two shabby journals. 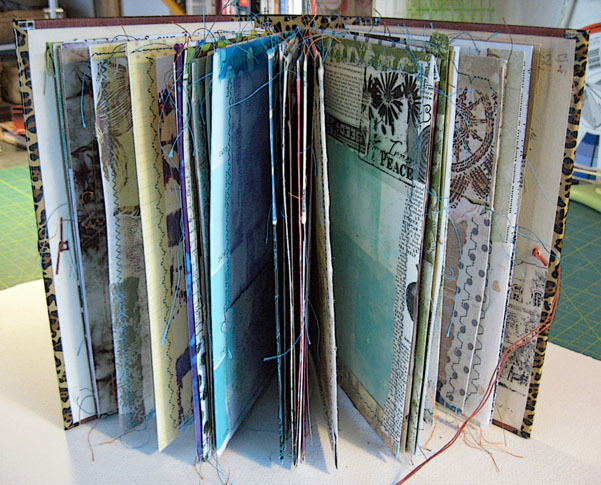 This isn't one that I consider an Art Journal, however, even though it's obviously arty and creative. Clear as mud, right? 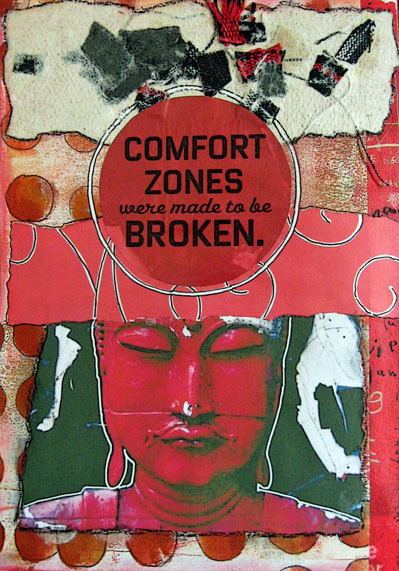 Periodically I ponder my life as an artist, in my endeavor to more clearly grasp where I fit in the scheme of things. For a long time it mattered a lot to me that the world saw me as an Artist, with a capital A. Maintaining that view required me to sell (or try very hard to) my work, including the ongoing marketing operation one is supposed to have in place in order to promote sales and build name/brand recognition. All that effort for virtually no return bankrupted me more than once. Nowadays I consider myself an artist with a lowercase a ~ in other words, one who has a creative response to life in every way possible, and who expresses who she is artistically. There are no have-tos or shoulds in this scenario...only want-tos. * maybe I can inspire some of you, or someone else, to be creative, to create art for the pure enjoyment of exploring one's own creative energy and seeing where it takes you. 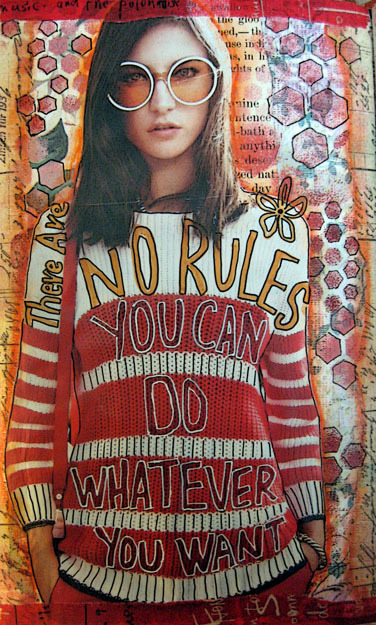 In the end, how we've lived our lives is all that will count ~ whether we are creative with the life we each have, whether we joyfully express ourselves however we see fit, whether we use our limited time to create beauty in our own spheres of influence. What won't matter is how much work we've sold or how well we've played the Artist-with-a-big-A game. Not in my world, anyway. Over the last few days I pulled the guts out of these four books and recovered them. 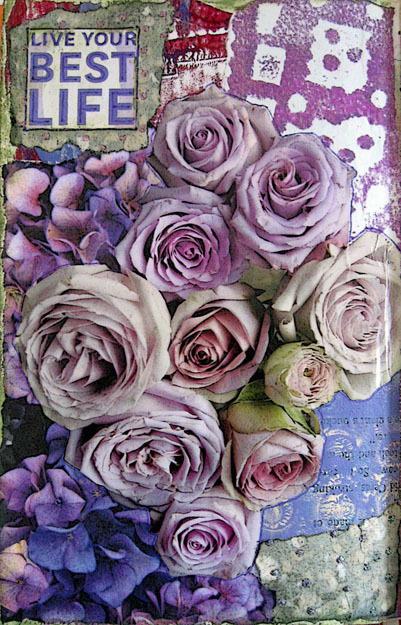 Each will be an art journal. The book on the left only had it's inner and outer spine covered, the rest have been fully remodeled. I've been collecting a variety of good papers that I'm anxious to use for art journaling ~ Fabriano 90# watercolor paper, two different types of paper by Canson, Rives BFK printmaking paper. The new journals will house largely, or exclusively, those papers. 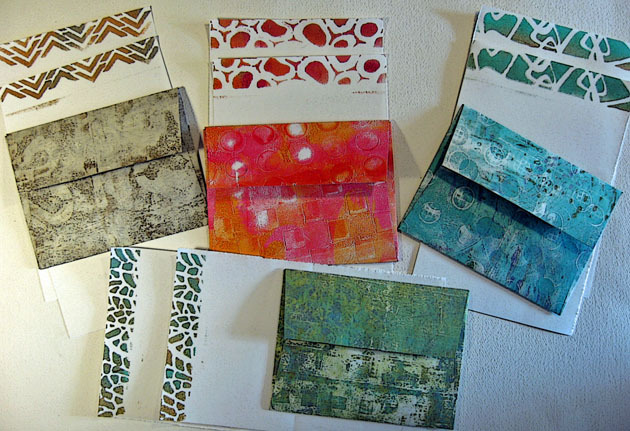 I still have a stack of Gelli offprints to use as pages as well, so they'll likely get thrown into the mix. 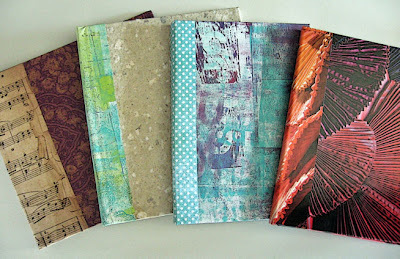 The two journals on the left have the widest spines, at about 1 inch; the other two, about 1/2 inch. I'll have two signatures each in the thinner books and possibly three in the bigger ones. I'm liking journals with fewer pages to fill...than, say, altering a thicker book and wanting to be finished with it way before using up all the pages. The reason I chose these books is because each is a good size for art journaling. The smallest is 7 x 10 inches. I'll post closeups when each journal is bound. And I'll be posting page images as I'm working in them. 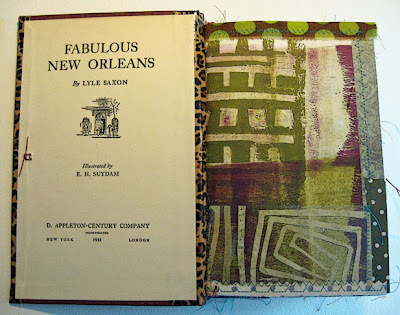 I've still got half a dozen pages to fill in my current art journal, Little Gems. More images from that book to come. 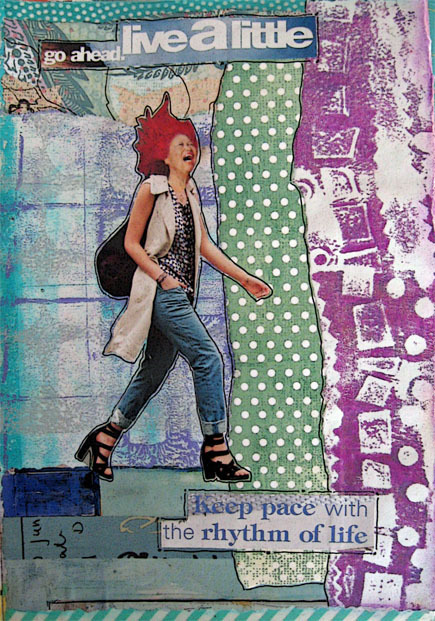 Yesterday I started working with Dina Wakley's Art Journal Freedom. What a great book this is. 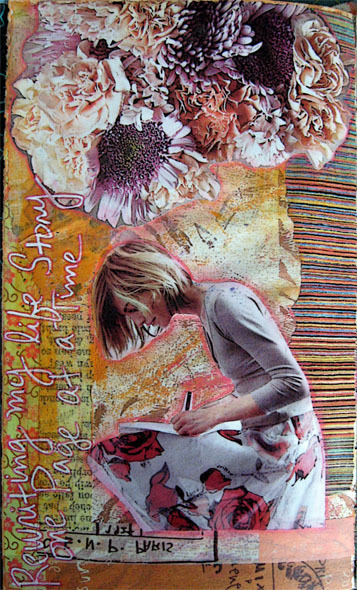 Dina's approach to art journaling is SO different from anyone else's, it's like a breath of fresh air. So I'm trying her methods, to stretch myself. 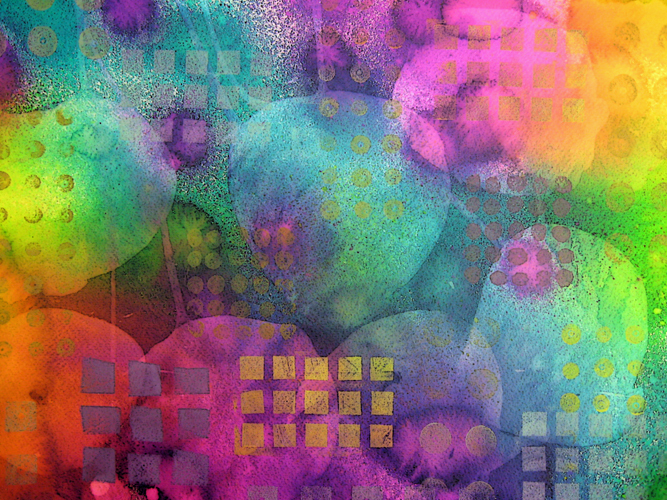 The first three images here are spray inks on watercolor paper. I've used Dylusions inks, there are a couple other brands available as well. All have slightly different properties (of course). The image just below also has Perfect Pearls spritzed on it, pearlized spray dye. I stamped the circles and squares with pigment inks -- they worked just fine. Meaning they're as waterproof as I need them to be once they're dry. 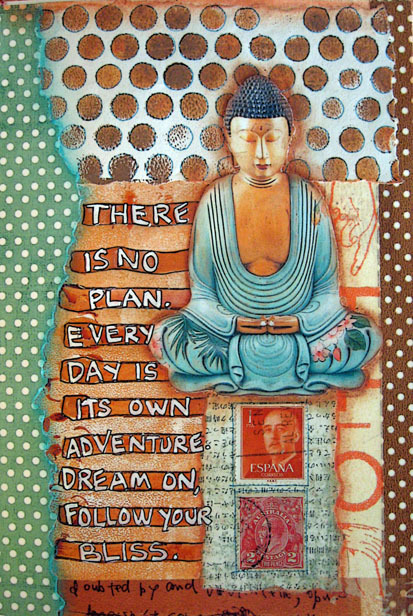 The piece above was stenciled with craft acrylic paint. That worked well too. These papers will be cut up to be backgrounds in mini collages, and likely some art postcards. 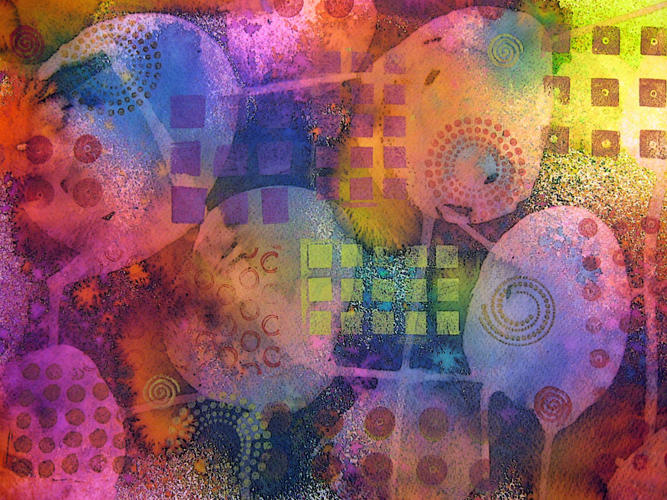 The three pieces are currently 11 x 15 inches. 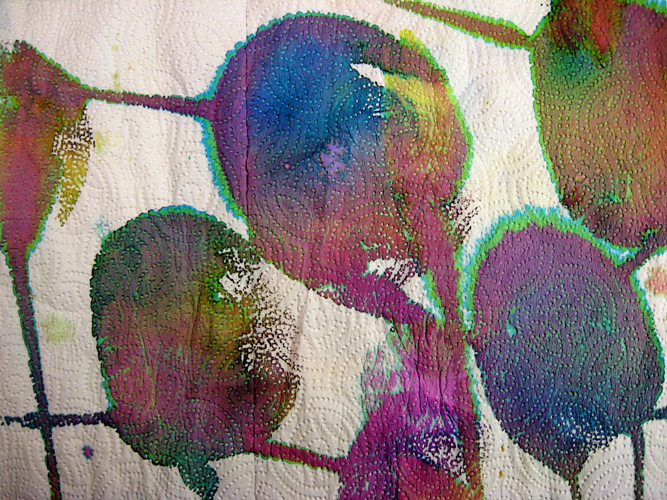 The last two images are paper towels that I used to blot the dyes. 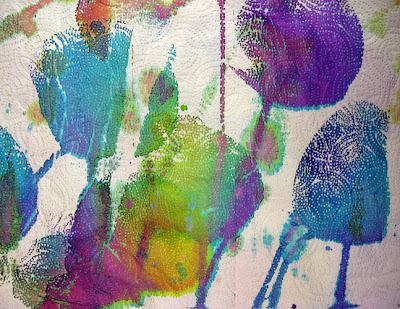 I used the whole roll of towels, rolled once across each painted paper. I'm not sure how I'll use these, but I sure like them. Recently I began reading my art technique books all the way through before I start doing any projects based on them. Most of the books I read previously to now I would put aside shortly after starting, because I'd launch into things quickly or maybe already try to do things differently than suggested. Ms. Contrarian, here. Consequently, it wasn't often that I actually finished the book, got all the juice out of it. Well now I'm reading the whole book first, to get the lay of the land, and then going back to the beginning to work through it. This is a much more organized way for me to try new things. Remember that stack of Gelli printed paper I made not long ago? 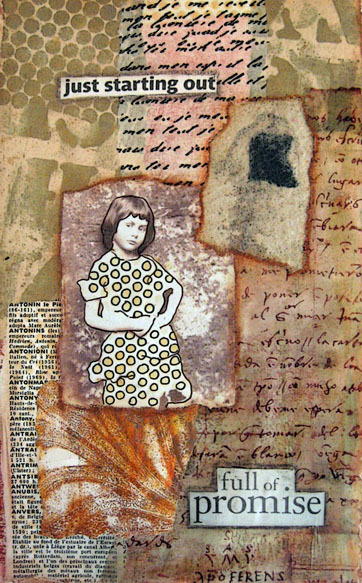 Some of it is being overprinted soon, some of it is being torn into pieces and used in art journal collages, and some is being made into envelopes for mail art. I folded these yesterday, and quickly printed matching stationery on drawing paper. 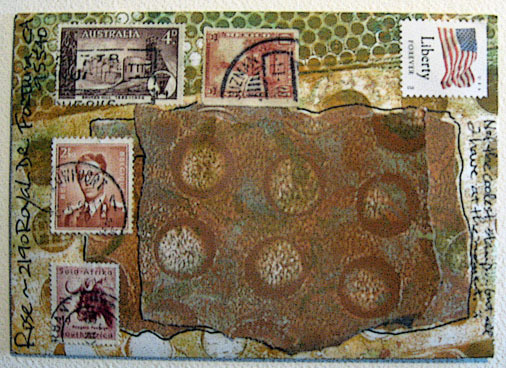 This is a piece of mail art going out today. I covered over the addressee's name for the photo. 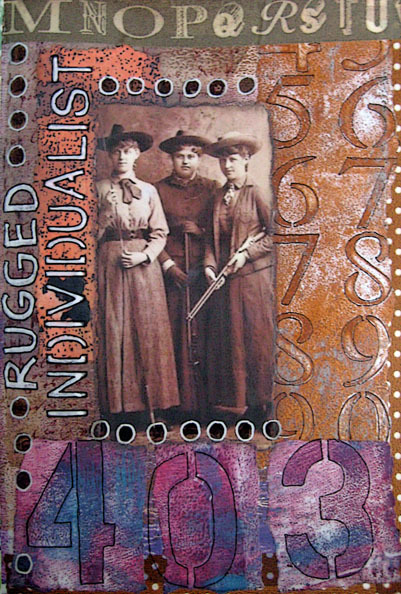 I can't think of a better way to use up little bits of ephemera and cancelled stamps, as well as using rubber stamps I've been collecting but have rarely used before now. 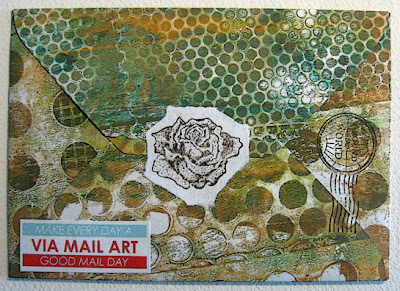 Mail art is also a great vehicle for getting handmade tags, ATCs, greeting cards etc. out there into the world. I've been going through my stamp collection and getting rid of ones I won't use ~ mostly inexpensive and/or recycled ~ to make way for a bunch of new stamps arriving soon. The castoffs are being donated to my local SCRAP (which now has a shop in Arcata!). There are numerous places online to get cool stamps. Two of my new favorites are Zettiology and CatsLife Press. Very unique stamps, stuff you don't find everywhere. I had heard about Art Abandonment, an idea taking hold in artistic communities of leaving art in public places for some unknown person to find. One leaves a small info sheet about Art Abandonment on the item, along with a link to post to when you've found a piece of art. 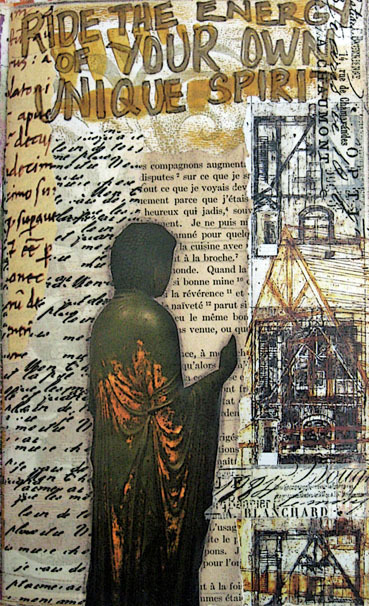 Mail art to me is very much like this, except you know who you're sending art to and you get mail art back from that person. So you build an art correspondence relationship with individuals over time. This really appeals to me. So this is what I'm doing. I'll make the pitch again ~ if any of you want to exchange mail art with me, please email me and let's set it up! I've had trouble falling asleep lately ~ creative excitement and energy have been keeping me awake. 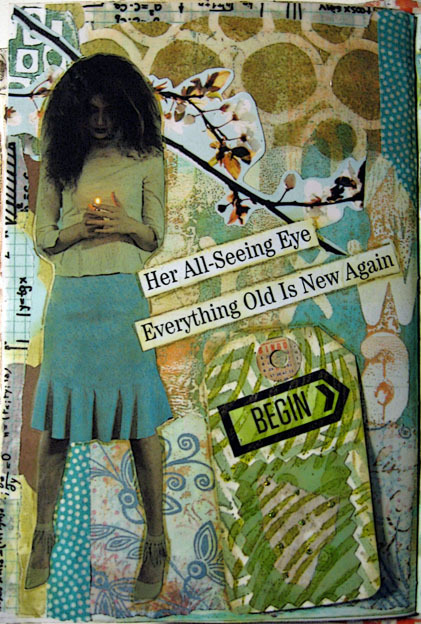 My art journal pages -- the ones I've been posting for the last few weeks -- really took a turn for the better since taking Kelly Kilmer's Finding My Way online class. She has numerous classes and many are similar...but the material contained within is all good stuff. I created a page here on the blog recently, called Great Classes. I've moved links to classes I've taken to the page and off the sidebar. The caption under each photo is a link to the class. 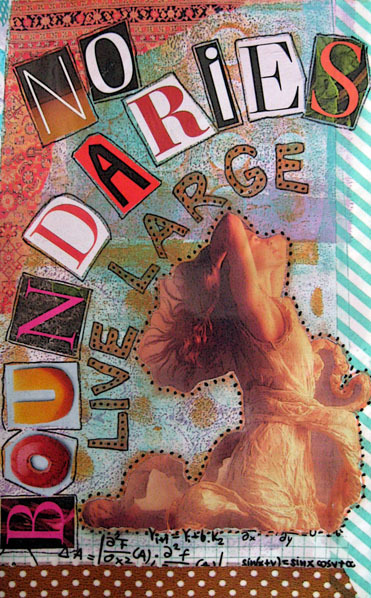 I just received an instructional DVD with Jane Davies, one of my go-to muses for painting and journaling inspiration. The DVD is called Scribble Collage, by Creative Catalyst. 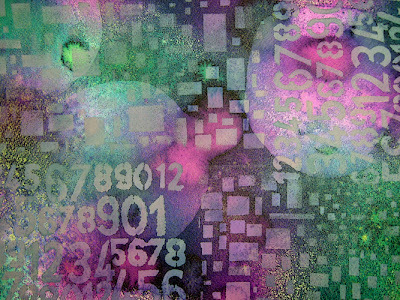 Acrylic Solutions by Chris Cozen and Julie Pritchard. 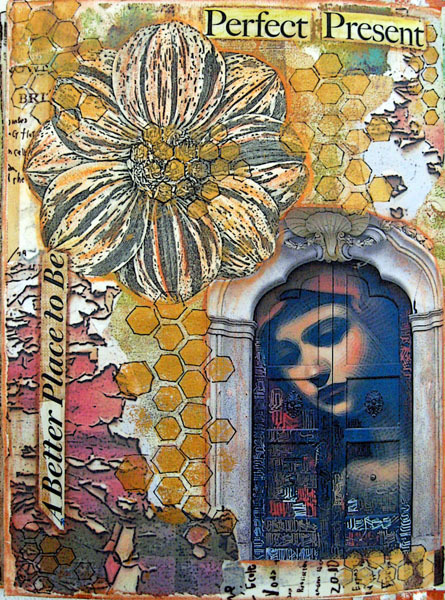 Lots of instruction on using acrylic paint and media in mixed media work. Good Mail Day by Jennie Hinchcliff and Carolee Wheeler. 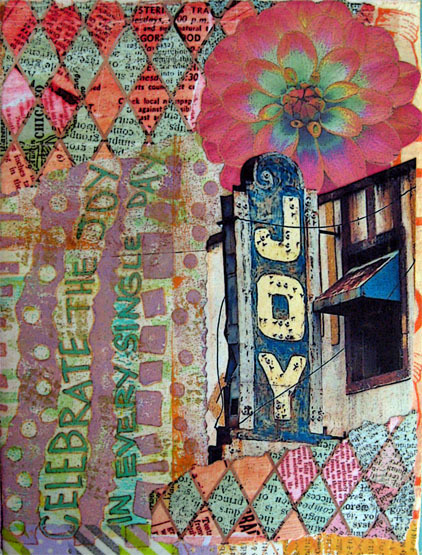 This is a primer for making eye-popping postal art. 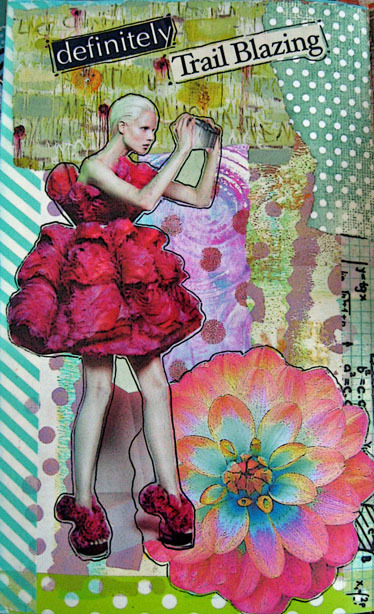 And yes, I am venturing into mail art. I recently became a member of Letter Writers Alliance and Postcrossing. I have a couple new penpals through LWA, and I've been sending and receiving postcards from around the world with random Postcrossers. These sites are for people who want to write actual letters and postcards via snail mail. 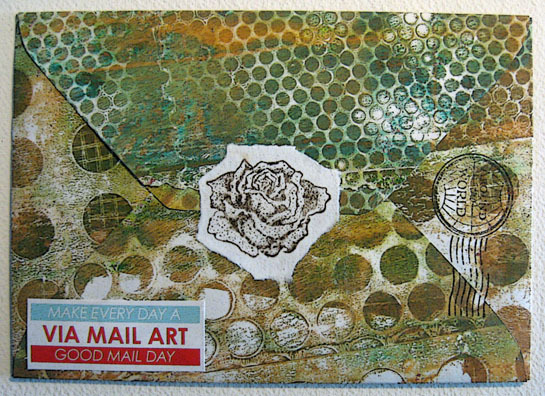 Soon I'll be corresponding with mail art penpals. 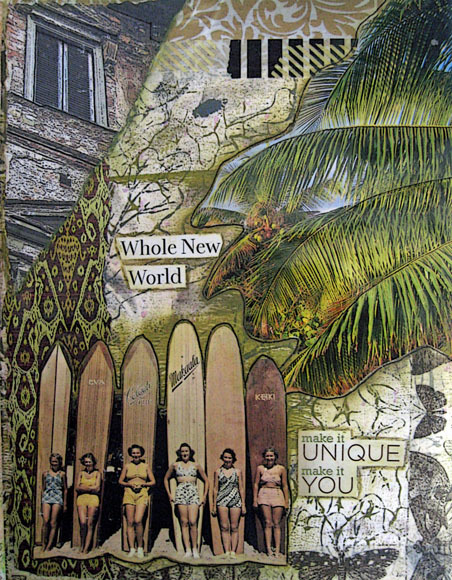 If any of you readers are interested in exchanging mail art and having me as a new correspondent, please email me. 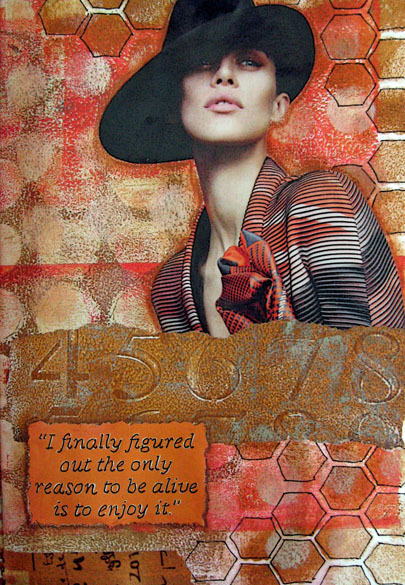 Last night I started to get into Dina Wakley's Art Journal Freedom. 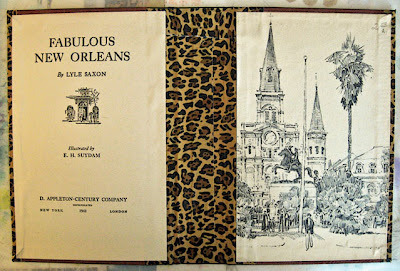 This book kept me up til the wee hours last night. 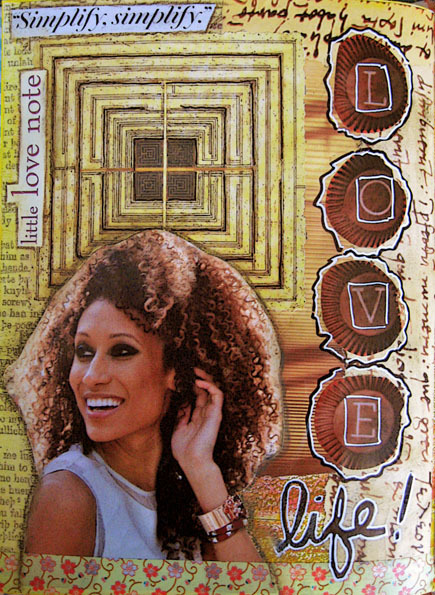 I love Dina's collages and journal pages ~ they're SO ALIVE! The garden bed I planted just a few weeks ago has been feeding me nightly for nearly a week. I've been having the best salads ever ~ lots of different greens, all fresh picked and clean, alive with flavor. Yesterday I had a second bed delivered, and now it's ready for soil and plants which will be added later this week. A while back I wrote about my night dreams and how they almost always fall into distinct categories, such as work dreams. Work, as in when I was employed by others. I still have those frequently despite the fact that I stopped working two years ago. This morning, though, I woke out of a dream where I had been offered the very best job of my life...and I was being counseled by one or two people to take the job...but I just kept explaining why I couldn't take the job, that it wasn't me any longer, that I detested office and organizational politics and wouldn't play that game...that I trusted myself to know what was right for me. GREAT dream. 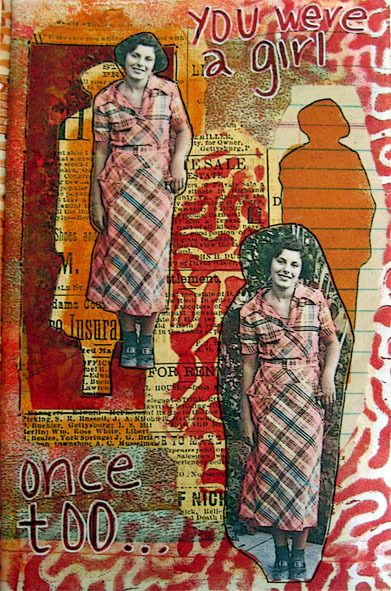 The young girl in this collage is my mother in 1935, when she was 13. It was taken in Miami Beach. The original photo was hand colored. Despite the fact that my mother and I never had a relationship that gelled into anything positive and that I had not been in contact with her at all for the better part of nearly 30 years (she died this January), I do have a small number of old photos of her to use in artwork. Below is a quilt I did in 2010. These images of her were taken at the same time as the photo above. The central image was printed on muslin; the other two are actual photos stitched onto cotton fabric. 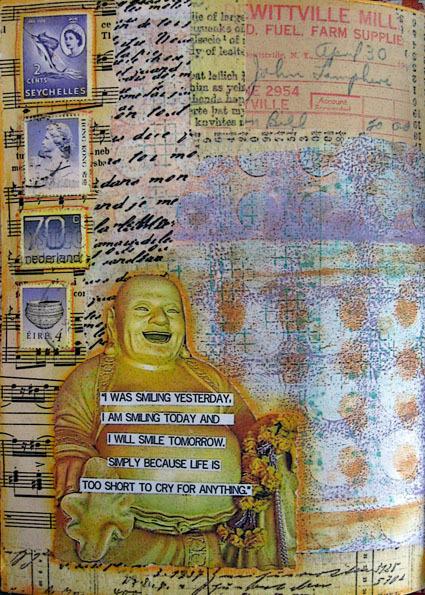 ...which segues into the phrase probably most of us have heard by now, "It's never too late to have a happy childhood." Art making is giving me that happy childhood now. 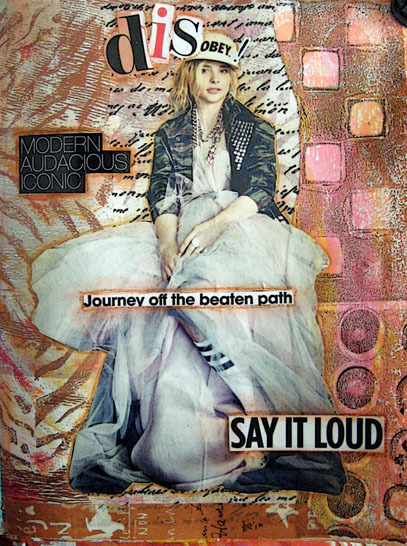 The art journaling and background-making activities continue unabated. The only other thing I did over the weekend was read. And it was mostly rainy so I barely even ventured out of Rose Cottage. Otherwise, not much more to say. Hope you have a grand week.